If you grew up in the late Sixties and early Seventies, and were keeping up with British invasion, you probably had some of your first experiences with English progressive rock with Nektar. I remember the band with some fondness and the classic album Remember The Future as being one of my favorites. In time for its 40th anniversary Purple Pyramid Records, a division of Cleopatra Records, reissues this seminal prog album with some wonderful bonus material. If you're familiar with original recording of Remember The Future, then you know how persuasive and entertaining it is, and I don't need to convince your of its worth. Suffice to say that this is English melodic prog rock at its trippy psychedelic best. The real gift here is having it packaged with the 'legendary' Boston tapes, considered to be some of the oldest recordings of the band. These eight songs were were recorded in a converted shop front studio in the Jamaica Plains section of Boston in the summer of 1970 on reel-to-reel tape. The were remastered for digital release in 2006 by the band, and now made available on this double CD set. What might strike you at first is that the songs lean more towards basic melodic rock with only nuances of prog. This doesn't make them any less interesting, but merely shows the seeds of Nektar eventual evolution. Notable, also, is the tripped out version of Bryan Hyland's 1962 hit Sealed with a Kiss. 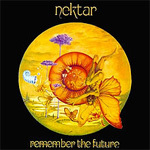 If you're a Nektar fan, or simply a fan of all things progressive rock, the 40th anniversary edition of Remember The Future should be in your collection. Recommended. If you're a Nektar fan, or simply a fan of all things progressive rock, the 40th anniversary edition of Remember The Future should be in your collection. Recommended.